The Wright Flyer (often retrospectively referred to as Flyer I or 1903 Flyer) was the first successful heavier-than-air powered aircraft, designed and built by the Wright brothers. They flew it four times on December 17, 1903, near Kill Devil Hills, about four miles south of Kitty Hawk, North Carolina, U.S. Today, the airplane is exhibited in the National Air and Space Museum in Washington D.C. The U.S. Smithsonian Institution describes the aircraft as "...the first powered, heavier-than-air machine to achieve controlled, sustained flight with a pilot aboard." The Fédération Aéronautique Internationale described the 1903 flight during the 100th anniversary in 2003 as "the first sustained and controlled heavier-than-air powered flight." The Flyer was conceived as a control-canard, as the Wrights were more concerned with control than stability. However it was found to be so highly unstable it was barely controllable. Following the first flight, ballast was added to the nose to move the center of gravity forward and reduce pitch instability. However the basics of pitch stability of the canard configuration were not understood by the Wright Brothers. F.E.C. Culick stated, "The backward state of the general theory and understanding of flight mechanics hindered them... Indeed, the most serious gap in their knowledge was probably the basic reason for their unwitting mistake in selecting their canard configuration". Upon returning to Kitty Hawk in 1903, the Wrights completed assembly of the Flyer while practicing on the 1902 Glider from the previous season. On December 14, 1903, they felt ready for their first attempt at powered flight. With the help of men from the nearby government life-saving station, the Wrights moved the Flyer and its launching rail to the incline of a nearby sand dune, Big Kill Devil Hill, intending to make a gravity-assisted takeoff. The brothers tossed a coin to decide who would get the first chance at piloting, and Wilbur won. The airplane left the rail, but Wilbur pulled up too sharply, stalled, and came down in about three seconds with minor damage. Repairs after the abortive first flight took three days. When they were ready again on December 17, the wind was averaging more than 20 mph, so the brothers laid the launching rail on level ground, pointed into the wind, near their camp. This time the wind, instead of an inclined launch, helped provide the necessary airspeed for takeoff. Because Wilbur already had the first chance, Orville took his turn at the controls. His first flight lasted 12 seconds for a total distance of 120 ft (36.5 m) – shorter than the wingspan of a Boeing 747, as noted by observers in the 2003 commemoration of the first flight. In 1904, the Wrights continued refining their designs and piloting techniques in order to obtain fully controlled flight. Major progress toward this goal was achieved with a new Flyer in 1904 and even more decisively in 1905 with a third Flyer, in which Wilbur made a 39-minute, Script error: No such module "convert". nonstop circling flight on October 5. While the 1903 Flyer was clearly a historically important test vehicle, its hallowed status in the American imagination has obscured the role of its two successors in the continuing development that led to the Wrights' mastery of controlled powered flight in 1905. The Flyer series of aircraft were the first to achieve controlled heavier-than-air flight, but some of the mechanical techniques the Wrights used to accomplish this were not influential for the development of aviation as a whole, although their theoretical achievements were. The Flyer design depended on wing-warping and a foreplane or "canard" for pitch control, features which would not scale and produced a hard-to-control aircraft. However, the Wrights' pioneering use of "roll control" by twisting the wings to change wingtip angle in relation to the airstream led directly to the more practical use of ailerons by their imitators, such as Curtiss and Farman. The Wrights' original concept of simultaneous coordinated roll and yaw control (rear rudder deflection), which they discovered in 1902, perfected in 1903–1905, and patented in 1906, represents the solution to controlled flight and is used today on virtually every fixed-wing aircraft. The Wright patent included the use of hinged rather than warped surfaces for the forward elevator and rear rudder. Other features that made the Flyer a success were highly efficient wings and propellers, which resulted from the Wrights' exacting wind tunnel tests and made the most of the marginal power delivered by their early "homebuilt" engines; slow flying speeds (and hence survivable accidents); and an incremental test/development approach. The future of aircraft design, however, lay with rigid wings, ailerons and rear control surfaces. After a single statement to the press in January 1904 and a failed public demonstration in May, the Wright Brothers did not publicize their efforts, and other aviators who were working on the problem of flight (notably Alberto Santos-Dumont) were thought by the press to have preceded them by many years. Indeed, several short heavier-than-air powered flights had been made by other aviators before 1903, leading to controversy about precedence (see Early flying machines). The Wrights, however, claimed to be the first of these which was "properly controlled". 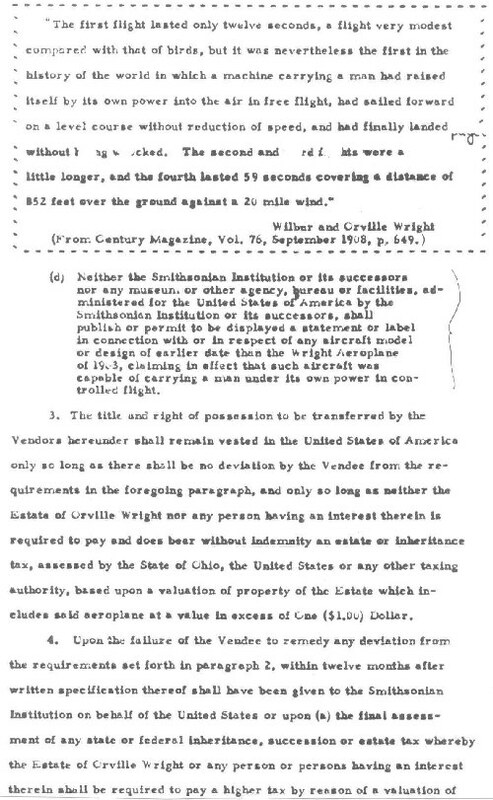 The issue of control was correctly seen as critical by the Wrights, and they acquired a wide American patent intended to give them ownership of basic aerodynamic control, despite the brothers' (and others in pioneer aviation circles) likely complete lack of knowledge of the 1868 British patent regarding roll control for aircraft. This was fought in both American and European courts. European designers, however, were little affected by the litigation and continued their own development. The legal fight in the U.S., however, had a crushing effect on the nascent American aircraft industry, and by the time of World War I, the U.S. had no suitable military aircraft and had to purchase French and British models. Charlie Taylor relates in a 1948 article that the Flyer nearly got disposed of by the Wrights themselves. In early 1912 Roy Knabenshue, The Wrights Exhibition team manager, had a conversation with Wilbur and asked Wilbur what they planned to do with the Flyer. Wilbur said they most likely will burn it, as they had the 1904 machine. According to Charlie, Knabenshue talked Wilbur out of disposing of the machine for historical purposes. In 1910 the Wrights first made attempts to exhibit the Flyer in the Smithsonian Institution but talks fell through with the ensuing lawsuits against Glenn Curtiss and the Flyer may have been needed as repeated evidence in court cases. In 1916 as the patent fights were ending, Orville brought the Flyer out of storage and prepared it for display at the Massachusetts Institute of Technology. (Wilbur had died in 1912.) He replaced parts of the wing covering, the props, and the engine's crankcase, crankshaft, and flywheel. The crankcase, crankshaft and flywheel of the original engine had been sent to the Aero Club of America in New York for an exhibit in 1906 and were never returned to the Wrights. The replacement crankcase, crankshaft and flywheel came from the guinea pig engine Charlie Taylor had built in 1904 and used for testing in the bicycle shop. A replica crankcase of the flyer is on display at the visitor center at the Wright Brothers National Memorial to this day. In 1925, Orville attempted to persuade the Smithsonian to recognize his and Wilbur's accomplishment by offering to send the Flyer to the Science Museum in London. This action did not have its intended effect, and the Flyer went on display in the London museum in 1928. It remained there in "the place of honour", except during World War II when it was moved to an underground vault Script error: No such module "convert". from London where Britain's other treasures were kept safe from the conflict. Researchers[who?] who promote the accomplishments of pioneer aviator Gustave Whitehead have commented that this agreement renders the Smithsonian unable to make properly unbiased academic decisions concerning any prior claims of 'first flight'. In 1948 the official handover of the Flyer was made to the American Civil Air Attache at a ceremony attended by representatives of the various flying organizations in the UK and by some British aviation pioneers such as Sir Alliott Verdon-Roe. Later in 1948, the Flyer was returned to the United States on board the Mauretania. When the liner docked at Halifax, Nova Scotia, Paul E. Garber of the Smithsonian's National Air Museum met the aircraft and took command of the proceedings. The rest of the journey to Washington continued on flatbed truck. While in Halifax Garber met John A. D. McCurdy, at the time the Lieutenant Governor of Nova Scotia. McCurdy as a young man had been a member of Alexander Graham Bell's team Aerial Experiment Association, which included Glenn Curtiss, and later a famous pioneer pilot. During the stay at Halifax, Garber and McCurdy reminisced about the pioneer aviation days and the Wright Brothers. McCurdy also offered Garber any assistance he needed to get the Flyer home. In 1981, discussion began on the need to restore the Flyer from the aging it sustained after many decades on display. During the ceremonies celebrating the 78th anniversary of the first flights, Mrs. Harold S. Miller (Ivonette Wright, Lorin's daughter), one of the Wright brothers' nieces, presented the Museum with the original covering of one wing of the Flyer, which she had received in her inheritance from Orville. She expressed her wish to see the aircraft restored. Numerous static display-only, nonflying reproductions are on display around the United States and across the world, making this perhaps the most reproduced single "pioneer" era aircraft in history, rivalling the number of copies - some of which are airworthy - of Louis Blériot's cross-Channel Bleriot XI from 1909. ^ a b "Telegram from Orville Wright in Kitty Hawk, North Carolina, to His Father Announcing Four Successful Flights, 1903 December 17". World Digital Library. 1903-12-17. Retrieved 2013-07-21. ^ "100 Years Ago, the Dream of Icarus Became Reality." FAI NEWS, December 17, 2003. Retrieved: January 5, 2007. ^ Culick, AIAA-2001-3385, Consistently with ignoring the condition of zero net (pitch) moment, the Wrights assumed that in equilibrium the canard carried no load and served only as a control device. ^ "Wright Flyer", A look at handling qualities of canard configurations, Nasa, p. 8, TM 88354, ...the Flyer was highly unstable... The lateral/directional stability and control of the Flyer were marginal . ^ Culick, FEC (2001), Wright Brothers: First Aeronautical Engineers and Test Pilots (PDF), p. 4, The backward state of the general theory and understanding of flight mechanics hindered them. ^ Lindberg, Mark. "Century of Flight." Wings of History Museum, 2003. Retrieved: August 27, 2011. ^ Crouch. Tom D. "A Machine of Practical Utility." American Heritage, Winter 2010. ^ Gibbs-Smith, C.H. (11 May 1956). "Correspondence: The First Aileron". Flight (FlightGlobal.com): 598. ^ "Archived image." at the Wayback Machine (archived August 17, 2002) Glenn H. Curtiss website Retrieved: January 21, 2011. ^ "Glenn H. Curtiss." at the Wayback Machine (archived February 28, 2003) Retrieved: January 21, 2011. ^ O'Dwyer, Major William J. History by Contract. Leutershausen, Germany: Fritz Majer & Sohn, 1978. ISBN 3-922175-00-7. ^ Hallion 1978, p. 55. ^ "Wright Flyer." Smithsonian Institution. Retrieved: January 21, 2011. ^ NASM Press Kit: The Wright Brothers & The Invention of the Aerial Age - News Media Photos." NASM. Retrieved: December 11, 2011. ^ "NC Cultural Resources Newsroom: Full-size Replica Wright Flyer Featured at N.C. Transportation Museum." ncdcr.gov, December 10, 2009. Retrieved: December 11, 2011. 40x40px Wikimedia Commons has media related to Wright Flyer.